MONTREAL - Air Canada has begun a trial program at Toronto's Pearson International Airport to ensure that passengers bring only carry-on baggage that will fit into overhead bins. The airline posted additional staff at the domestic and transborder departure areas at Pearson Tuesday to ensure travellers check their over-sized bags and prevent them from being carried on board. 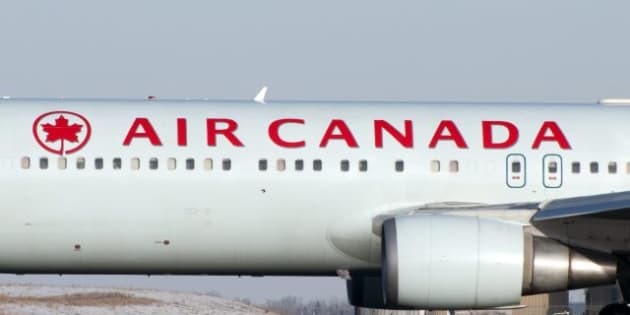 The trial, which has no announced end date, comes after the Montreal-based carrier (TSX:AC.B) announced earlier this month that it will begin charging a $25 fee for the first checked bag on its lowest-class domestic flights and on flights to and from the Caribbean and Mexico. The fee comes into effect on Nov. 2. Air Canada has charged for a traveller's first checked bag on U.S.-Canada transborder routes since 2011. "This will also facilitate an orderly transition to the implementation of a domestic first checked bag fee beginning in November," said spokeswoman Isabelle Arthur. Transport Canada rules allow passengers to carry on two unchecked items. Air Canada specifies that a personal item can include a backpack, briefcase or laptop computer measuring up to 16 by 33 by 43 cm, and a standard item such as a suitcase measuring up to 23 by 40 by 55 cm including wheels and handles. Those travelling with an infant on their lap can carry on an additional standard article. Arthur said there are no immediate plans to extend the trial program to other Canadian airports. Meanwhile, WestJet Airlines (TSX:WJA) said it isn't stepping up surveillance of what passengers bring on board its aircraft ahead of the introduction of its own checked baggage fee Oct. 29. "No change for us," said spokesman Robert Palmer. "We have always made the announcement about carry-on needing to fit in the sizing devices, and we do ask people to put their bags in the device to make sure it will fit." The Calgary-based airlines is also introducing a $25 first checked bag fee on all flights operated by WestJet and its regional airline Encore within Canada and to the United States. The fee will not apply to flights to Mexico, the Caribbean, Central America and Europe. WestJet chief financial officer Vito Culmone recently said it expects the new fee could reduce checked bags by 20 to 30 per cent, based on experience of other airlines. Both airlines expect the new baggage fee will affect about 20 per cent of passengers.